Venus Williams add another feather to her cap. 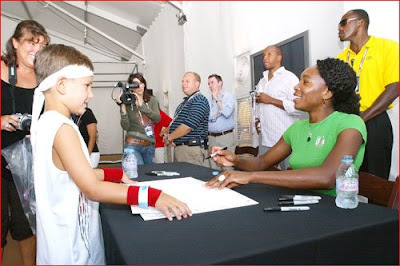 The seven-time Grand Slam champion were at the Hospitality Village, the tennis centre on USTA Member Appreciation Day signing copies of her new book, 'Venus'. Also around the Village was former tennis star Murphy Jensen, filming 'Explore the Open'. 'Venus' is a collection of photographs of Williams, one of the world’s greatest tennis players, taken by fashion photographer Koto Bolofo, showcasing her elegance both on and off the tennis court in black and white, as well as color photos. The book is by Bolofo in collaboration with Williams. Williams said she had never thought she would have a book like this and is just happy to have had the opportunity to do it. “I just hope people enjoy the book and put it on their coffeetables,” Williams said. In the meanwhile, Venus advances to the 4th round after beating No. 27 seed Alona Bondarenko of Ukraine 6-2, 6-1.